It’s the HK version of Pennywise! Now I understand all those pictures of kids crying when they meet Santa. This would scare me the same way! Well, I’d rather they torture themselves with HK instead of poor cats and dogs. I think this has proved to the world that hk fanaticism should be forbidden be law, this is self mutilation and abuse, they need professional help. Just imagine this: somewhere out there, Hello Kitty is freaking out without most of her head and hands. And no one will know because she doesn’t have a mouth to SCREAM. funny Eize, very funny! best comment in a longgggggggggg time. Yes you’re correct…this was taken in a store in Shinjuku, Japan, from memory last October, 2007. I am not a HK fanatic (this is me in the picture) but I too just laugh at some of the stuff HK creates and this was too good to pass up! It cost me round $30 AUS and I’ve only seen it in HK Sanrio stores in Japan. 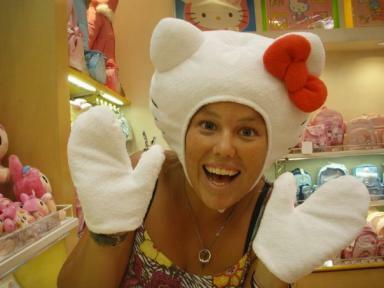 This is not something that I would walk around in public wearing but I just find the Japanese culture with HK hilarious! They also had the green frog thing (Keroppi) too. emma-chan- where do you you think i can buy one of these for halloween? can you think of anywhere online that sells them? i dont want to go the white cat ear/ headband route; i like the head/ hat. I would kill to have this!! I would actually wear it to work on Halloween where they know I’m a Hello Kitty fanatic!!! Did anyone find this? I REALLY must have one! Seriously, I need this. If anyone can link me to a place to buy this. It’s for my niece’s birthday party, lol.